Our base of exploration was an RV park on the eastern edge of the city called the, “Town and Country Campground”. It had good access to downtown via the TransCanada highway and reasonable rates. A full service, 30 amp, pull-through site went for about $34.00 a night (plus taxes). That included wi-fi which was okay, washrooms which were relatively clean and laundry facilities which were adequate. A games room, playground, camp store and mini-golf course rounded out the amenities list. Missing was a swimming pool which was under construction. Had we been travelling with children, the campground’s location next to “Fun Mountain Water Slide Park” would have been a definite plus. And, just down the road was the “Tinkertown Amusement Park” which featured a variety of rides and attractions for kids of all ages. The first stop on our “Winnipeg discovery tour” was supposed to have been a place called “The Forks” near the city center however, as we were heading downtown, we passed a most unusual building that we had to check out. It was the Royal Canadian Mint, or at least the Winnipeg branch. The main office was in Ottawa. The Winnipeg facility was responsible for producing circulation coins - from nickels to toonies. Paper (polymer?) money was made elsewhere. Most of the ground floor was taken up by a huge gift shop and various interactive displays. Guided tours were available and definitely worth taking. Not only was the machinery used to produced the coins amazing to watch but the history and lore surrounding the currency was fascinating as well. For example, the very first Canadian one dollar coin was supposed to have had a picture of a canoe paddled by two voyageurs rather than a Loon. The master die used to stamp out the coins was created in Ottawa, then shipped to Winnipeg. It never arrived. Despite an exhaustive search, the die was never found. With the release date looming and the possibility of counterfeiting very real, artisans at the Winnipeg facility came up with another design - a coin with the picture of a Northern Loon. As our guide pointed out, perhaps it was for the best. Had the original design been used, our one dollar coin might have been known as a “Canoey”. The building in which the mint was located and which caught our attention had a very original and unique shape. It looked like a mountain. Rumour had it that the architect who designed the structure had grown tired of gazing over the flat prairie landscape and decided to do something about it – hence the novel, mountainous shape. 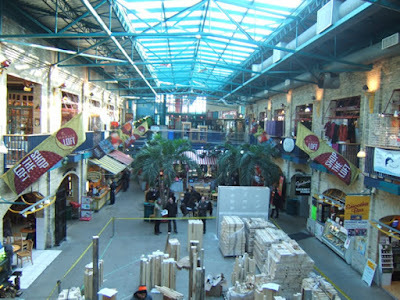 Continuing on, we eventually arrived at what was supposed to have been our original destination, a place near the downtown core called, “The Forks”. Located at the confluence of the Red and Assiniboine Rivers, it was billed as Winnipeg’s top tourist attraction. Once primarily an industrial area with rail yards, warehouses, and commercial buildings, the location had been revitalized and now boasted green spaces, pedestrian trails, river walks, bicycle paths, playgrounds, exhibits, and live performance venues. Some of the old commercial buildings had been saved and remodelled. Now they housed restaurants, shops, cafes, boutiques, offices and a hotel. It reminded me of Granville Island in Vancouver. After walking around and exploring the surrounding area, we took a break and joined a boat tour (Splash Dash Boat Tour) which left from a small marina beside “The Forks”. The tour took us along the shorelines of the Red and Assiniboine Rivers. Neither one was particularly attractive with much of the shoreline consisting of mud. The city had tried to mitigate this by building walkways in some spots and dumping rock along the bank in other places but, a lot of mud still remained. In a few locations, grass had also been planted but with ice jams and water levels fluctuations as much as 18 feet in the spring, made survival a struggle. The water itself was a muddy brown colour which was typical of a prairie river, according to our guide. Typical or not, it did not look very inviting and, even though the day was hot, no one was swimming or even wading in the water. As for fish, apparently there were some around but only the most fool-hardy or hungry would dare catch and eat them. On the plus side, our tour guide was very entertaining and informative, regaling us with stories about famous people, historic landmarks and interesting events - along with a dash of self-deprecating Winnipeg humour. The tour itself provided an unobstructed view of “The Forks”, the Winnipeg and St Boniface skylines and the stylish Provencher Pedestrian Bridge which linked downtown Winnipeg with the community of St Boniface. The bridge design was both modern and striking with a tall, concrete column at the center and guy wires radiating out on either side. The style was similar to many bridges built in B.C. Unique to this structure however, was a semi-circular restaurant called, "Mon Ami Louis", located in the middle and suspended over the Red River. Across the river from Winnipeg was the community of St Boniface, home to a large francophone population. 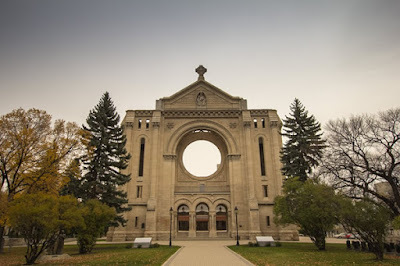 Once a separate city, St Boniface was now part of greater Winnipeg. My wife and I took a guided walking tour and discovered there was a lot more to the area than we had imagined. The tour began at the old city hall which had been converted into an art gallery (La Maison des Artistes) where works from local artists were displayed. The city hall, the post office across the street and the nearby fire hall were all built at about the same time – around the turn of the century – by the same architect. Over a century later and they still looked in great share. Other tour stops included the Centre du Patrimoine/Heritage Centre, established to preserve and promote Francophone history in Manitoba, Fort Gibraltar, a reproduction of the original fur trade post built by the North-West Company around 1810 and Cathédrale de Saint-Boniface. Once a magnificent cathedral, most of the building was destroyed by fire in 1986. Only a portion of the front and side walls remained. 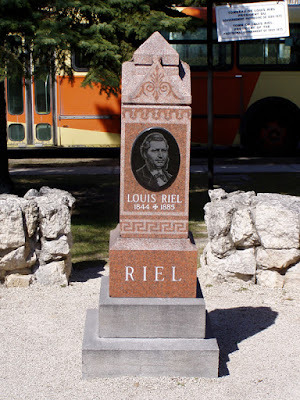 In front of the cathedral was a cemetery containing the grave and historic plaque for the French and Metis leader, Louis Riel. Next door was the St Boniface Museum. Housed in a former Grey Nuns convent, the museum featured artifacts and displays commemorating French-Canadian and Métis history in Western Canada. The building itself was not only the oldest in Winnipeg, but the largest traditional oak log structure still standing in North America. With such a large francophone population, it was no surprise that there were many excellent French eateries. Our favourite was a little bakery called, “La Belle Baguette” which was known for its delicious croissants, among other things. Unfortunately, by the time we got there after our walking tour, all the croissants were gone. Fortunately, there were a “few” other pastries to sample which eased our disappointment. At the western end of the Provencher Pedestrian Bridge, on the Winnipeg side of the river was the Canadian Museum for Human Rights. The driving force behind the museum was Israel Asper, founder of CanWest Global Communications Corp. Mr. Asper personally fund-raised and donated much of the money needed for this project. 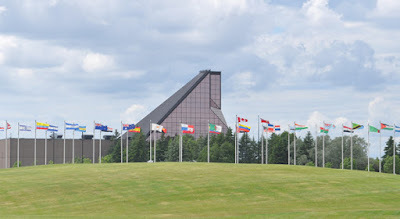 To acknowledge his contribution, the Canadian government allowed the museum to be constructed in Winnipeg rather than Ottawa, making it the only national museum to be located outside the Capital Region. As the name suggested, the museum was dedicated to the evolution, celebration and future of human rights. The building itself was massive with a very distinctive and unique shape. Inside, the number of exhibits was so large that at least a full day was required to see everything. West of the Canadian Museum for Human Rights and a little north of “The Forks” was a huge stone structure known as Union Station. This railroad terminal was designed in the early 1900’s by the same architects who did Grand Central Station in New York City. The recently renovated interior, dominated by a large central dome was a powerful reminder of a time long past when rail travel was stylish and fashionable. Union Station was also the home of the Winnipeg Railway Museum, a 37,500 square foot space filled with railroad history and artifacts. Across the street and a little to the south was the location of Upper Fort Gary. At one time, it had been an important Hudson’s Bay trading post and fort. Now, only the front gate remained. Further west, along the banks of the Assiniboine River stood the Manitoba Legislative Building. 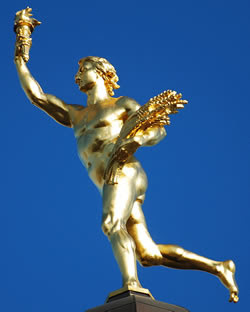 Of all the buildings in Winnipeg, this one was probably the best known because of the “Golden Boy” statue atop the copula or domed roof. The building itself was magnificent and built at and for a time when Prairie growth and optimism was thought to be boundless. During our visit, the Legislative Building was embroiled in a controversy involving historian, Dr. Frank Albo. In his book, “The Hermetic Code”, Dr. Albo claimed the Manitoba Legislative Building was actually a copy of King Solomon’s Temple. His claims have yet to be substantiated however he did on occasion, conduct tours where he revealed a trail of occult clues concealed in the building’s architecture including: hidden hieroglyphic inscriptions, numerological codes, and Freemason symbols. Unfortunately, none were available while we were there so we had to content ourselves with a regular legislature tour. Further to the west along the Assiniboine River but still within the city limits was Assiniboine Park, a huge green space filled with playing fields, playgrounds, miles of trails, an English Garden, the Leo Mol Sculpture Garden, a conservatory and the Lyric Theatre (a live performance venue) as well as restaurants and cafes. 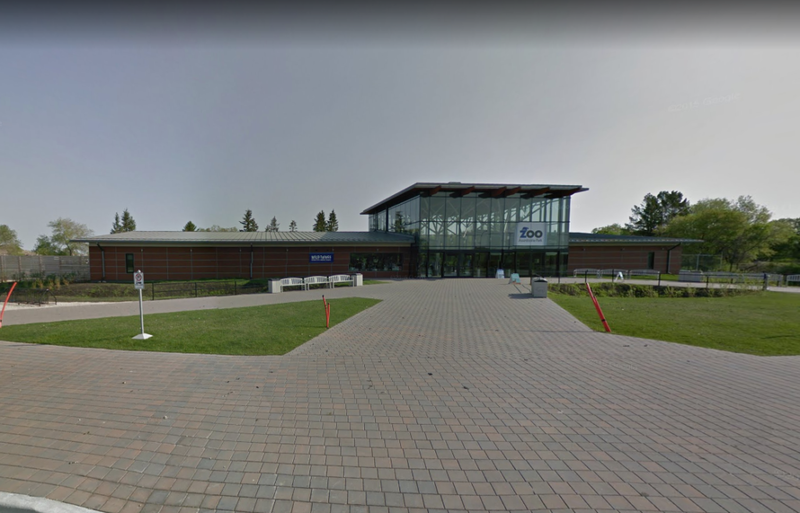 Next door was the Assiniboine Zoo with close to 200 animal species from around the globe. To the northwest lay the James Armstrong Richardson International Airport and a museum of interest to aviation enthusiasts - the Royal Aviation Museum of Western Canada. Their collection was an interesting and extensive mix of military and civilian aircraft, all of which had some connection to Western Canada. 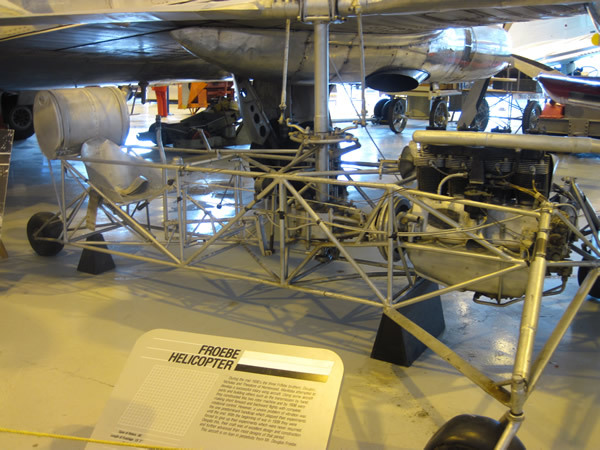 For example, one of their prize exhibits was the Froebe Helicopter. It was designed and built by Doug Froebe and his brothers, Theodore and Nicholas on their Manitoba farm during the 1930’s. Made from salvaged parts and scrounged materials, their creation actually flew, giving it the distinction of being the very first helicopter built and flown in Canada. 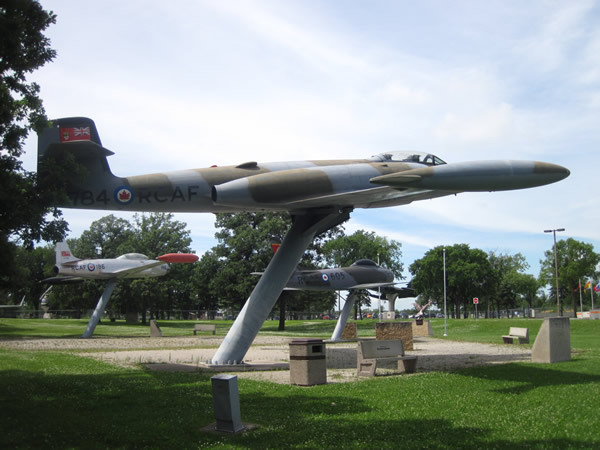 On the opposite side of the airport, just outside Canadian Forces Base – 17 Wing, Winnipeg, stood a number of former RCAF aircraft, now on display. Many were mounted on huge steel pedestals complete with detailed identification plaques. It was a sizeable and impressive collection which, anywhere else would have been celebrated and publicized. Unfortunately, few people in the city seemed aware of its existence. In fact, the collection didn’t even rate a mention on the base web site. Bernstein’s Delicatessen near the airport, couldn’t be beat. 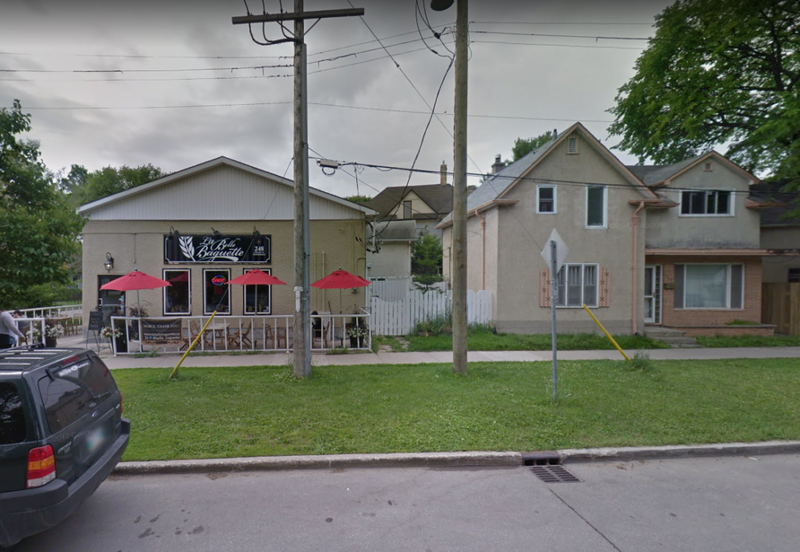 Located in a strip mall, this restaurant could best be described as “non-descript” with little to hint at the mouthwatering goodness waiting inside. 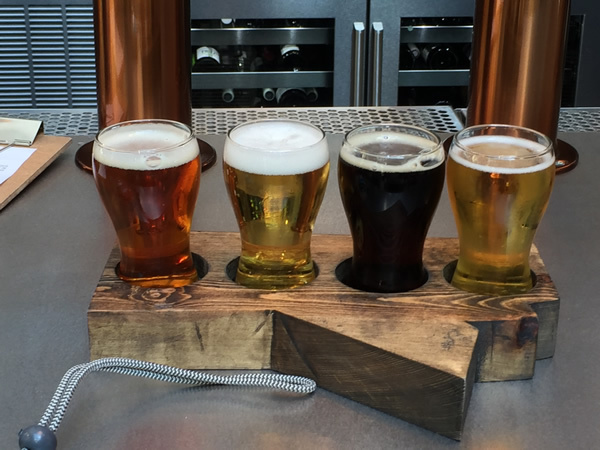 Much of the menu was made in-house including their incredible smoked meat. Served on their rye bread and slathered in mustard, it was heaven on a plate. Also worth sampling (among so many other delicious items) was their chicken matzo ball soup and potato latkes. For something a little more hip and nouveau, there was the Sherbrooke Street Delicatessen. 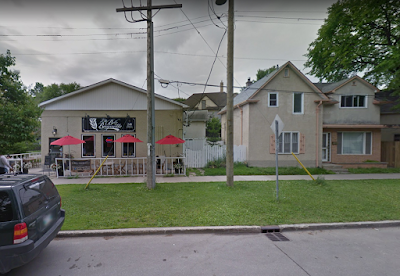 Located in a trendy part of Winnipeg, the food was also delicious. Their smoked meat was divine, but the bread on which it was served was a light rye that lacked density, chewiness and flavor. Perhaps, it was a little too nouveau for my tastes. The matzo ball soup was spot on but the borsch was quite spicy – definitely a more modern take on a traditional recipe. All too soon, our time in the city was over. 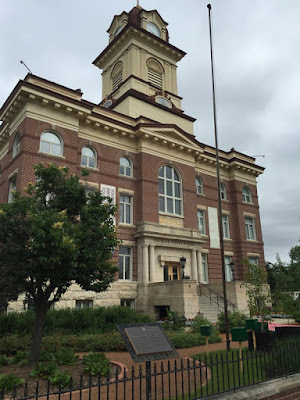 We had spent four days exploring Winnipeg’s many sites and attractions yet hadn’t seen them all. If there’s a moral or message to this story, it might be this - don’t judge a book by its cover or a city by its humour. Like ying and yang, if there’s a lot to complain about then there must also be a lot to appreciate and enjoy. That was certainly true with Winnipeg.